Mark Richard Hamill is an American actor, voice artist, producer, director, and writer, best known for his role as Luke Skywalker in the original trilogy of Star Wars. More recently, he has received acclaim for his voice work, in such roles as the Joker in Batman: The Animated Series, Firelord Ozai in Nickelodeon's Avatar: The Last Airbender, and various other animated series, films, and video games. 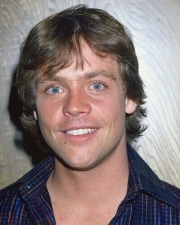 Hamill was born in Concord, California and raised in Oakland, the son of Virginia Suzanne (née Johnson) and William Thomas Hamill, who was a captain in the U.S. Navy. He was one of seven children: two brothers, Will and Patrick, and four sisters, Terry, Jan, Jeanie, and Kim. When Mark was a child, his father's career meant numerous relocations, and he attended different schools throughout his childhood. In his elementary years, he went to Poe Middle School. At age 11, he moved to the 5900 block of Castleton Drive in San Diego where he attended Hale Junior High School and then, during his freshman year at James Madison Senior High School, his family moved to Virginia. By junior year, his father was stationed in Japan where Mark attended Nile C. Kinnick H.S. and was a member of the drama club. After that he attended Annandale High School in Annandale, Virginia. He majored in drama at Los Angeles City College. Hamill's early career included voicing the character Corey Anders on the Saturday morning cartoon Jeannie by Hanna-Barbera Productions. He also portrayed the oldest son David on the pilot episode of Eight Is Enough, though the role was later performed by Grant Goodeve. He acted in TV series such as The Texas Wheelers, General Hospital, The Partridge Family, and One Day at a Time. One of his earliest films was the made-for-TV film The City. In 1978, Hamill married dental hygienist Marilou York. They have three children together: Nathan , Griffin and Chelsea Elizabeth . His son Nathan was born during filming of Star Wars Episode V: The Empire Strikes Back and had a cameo role in Star Wars Episode I: The Phantom Menace playing one of the Royal Guards of Naboo. Whole or part of the information contained in this card come from the Wikipedia article "Mark Hamill", licensed under CC-BY-SA full list of contributors here.